Managed by: Borsarmulu Park Management Sdn. Bhd. 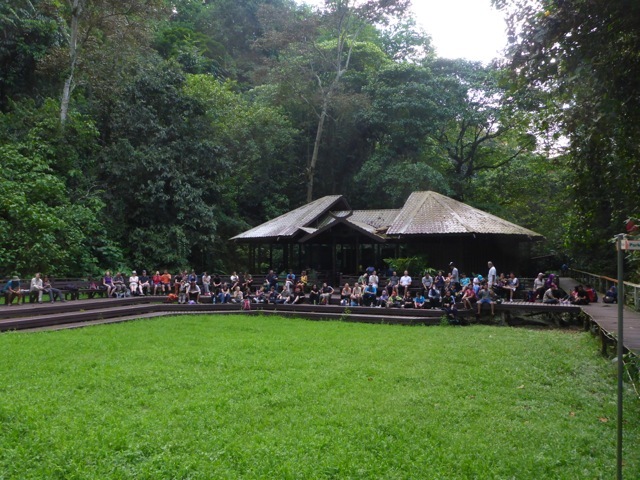 1) To protect its significant natural featues like the caves, forest and the wildlife. 2) To provide opportunities for visitors to use, to enjoy and understand its purpose and significance. Mulu was successfully listed as World Heritage Site in 2000 and Mulu meet all four criteria needed by UNESCO. Daily flights from Miri and Kuching and three times a week from Kota Kinabalu is a wholly owned subsidiary of the National Carrier- Malaysia Airlines Services. It is possible to walk into Mulu via ‘The Headhunter’s Trail’ which takes its name from its historical role as the route taken by warring parties between the Tutoh and Medalam rivers. The trail runs between Limbang, a picturesque town on the Limbang River, entering Mulu on its northern boundary and trekking down through Camp 5 and then onto Mulu Park Head Quarters. (or visa versa). The area is very isolated and the nearest town is many hours away, the trail is well marked and maintained but tree falls and river floods can cause confusion. If you want to travel the Headhunters Trail you must contact a licensed tour operator to make arrangements for you. Which ever adventure you choose to get to Mulu it is just an introduction to the jungle experience waiting for you. Local community provides reliable shuttle services to and from the airport. The walk to and from the airport can be long and hot, we encourage you to support the local community where ever possible. What a better place to start on your arrival in Mulu! Café Mulu is open daily from 7.30am and last orders by 8.30pm. The cafe is located at Park Head quarters and is an open air restaurant serving a range of local foods including forest vegetables such as ‘Paku fern’ and western dishes. Due to the isolation and sometime limited access to some produce, the availability of dishes may vary. The outside patio is a great place to relax and read, meet other travellers, play some of the games provided or just relax with a cold beer or a fine wine. 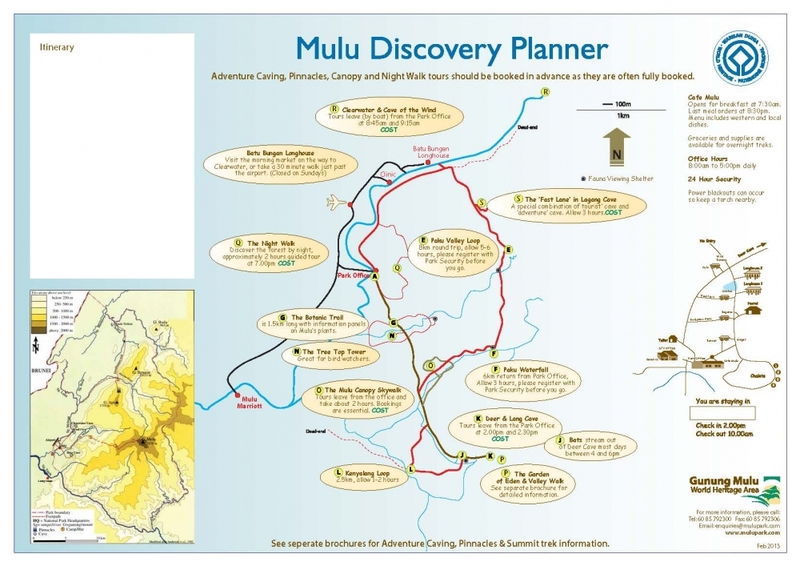 Don’t forget to visit the Mulu Discovery Centre which is adjacent to the dining area, it features the biological and geological story of the park via information boards, video presentations and a library of resources books for you to read is available in Front Office. Daily access to Wi-fi can be purchased from the Park Office (8am – 5pm) for a nominal fee per device. The broadband is limited in this region and the fee helps to manage the usage. Please note these fees are for park entry only, additional fee for Tour & Activites still apply. Mulu is not strongly affected by the monsoonal seasons that most of South East Asia experiences. July – September are the driest months (it only rains about 3 days in 7) but it is also hotter without the cooling rains. March and April have a little less rain than the wettest months of October – January and May – June. By early afternoon the temperature has risen to about 34 degrees and 60% humidity; around 3.00 – 5.00 pm it will start raining and the humidity increases to 90%. Showers may last 30 – 60 minutes, but after the rain the air is cool and fresh, the evenings are usually fine. As it rarely rains in the morning, those doing the Pinnacles climb go up in dry conditions and if they are slower to return they may get wet towards the end of their walk. Cancellation of the Pinnacles climb due to wet weather would average no more than 10 days per year. Yes we do get between 4 – 7 metres of rain each year so you will experience wonderful tropical down-pours which swell the rivers and sometimes make them flood. June, July, August and September are usually busier than other times of the year. We recommend that at all times you should make bookings for accommodation and guides in advance to avoid disappointment. Once the facilities are full and the guides booked then there is nothing we can do to help even though you have travelled a long way to visit.